New to worm composting? Looking for some quick and dirty info before jumping in head-first? Well this is will be a great place to get started. Regular (soil and garden) earthworms cannot be used for worm composting. They will die if added to an indoor worm bin. You won’t likely find this species on your property (unless you live on a farm, or happen to introduce them into your compost heap). It is widely believed that a composting worm can process the equivalent of it’s own weight in waste each day. Under highly optimum conditions (not likely to be attained with a small home system) red worms have been found to process multiple times their own weight! This is very much dependent on the foodstock and how well managed the system is. A reasonable guideline to follow is 1/4-1/2 total worm weight in waste per day. So if you have a pound of worms, they should be able to process roughly 1/4-1/2 lb of food waste per day. Keep in mind however that you may need to feed them less during the first couple months since they usually require a period of acclimation when added to a new system. Red worms technically graze on the microbial community that colonizes waste materials – not really the waste itself (although they certainly ingest some of the rotting waste in the process). Some research has indicated that protozoans are the primary food source, while there is also evidence that fungi and other microbes are consumed as well. There have been a number of research studies indicating that vermicomposting can significantly reduce levels of pathogens in waste materials, such as biosolids. Stay tuned for more Worm composting ‘Quick Facts’! My mom and I want to start vermicomposting and I have found your website really helpful so far! We have a couple questions. How many red worms should we start out with, and will we have to continue buying more or will they reproduce enough? Also, we do not have a lot of leaves in our yard besides eucalyptus leaves. Can red worms eat eucalyptus, as we have heard they are toxic. Patricia – nice to see you around these parts again. Sorry about your worms though! White, hair-thin worms could either be white worms (aka pot worms) or horsehair worms (nematomorpha). The latter would seem stiff – almost like plastic string – whereas the white worms are more like regular earthworms. Robin – great advice from Stingray (thks) – will just add that if you ARE going to keep them wet, it’s vitally important that they have excellent air flow. And open system or wooden system are ideal. A wet, enclosed plastic bin in hot temps is a disaster waiting to happen. Rachelle – Red Worms breed readily, so there is not required number you need to start with. If you can get a 1/2 lb or 1 lb that should be more than enough. Just make sure you are feeding accourdingly (don’t assume they can eat “X” amount of food). I wouldn’t feed them eucaplytus leaves, and really, leaves in general are not needed in a worm composting system. I’d take an absorbent bedding, like shredded cardboard, over leaves any day. **IMPORTANT** – For anyone with general questions about vermicomposting, be sure to sign up for the email list (accessed via the “Newsletter” link up top) so you can get access to the RWC Vermicomposting Guide pdf. You will find a lot of the info you are looking for all in one spot. I will actually be launching a “complete” version (for sale) fairly soon, but this original version will always be available free of charge. Bentley, Its nice to be back on here. When I put my castigs away I checked for moisture. Do I need to periodically open the zip locs and add some moisture or will they be ok as they are in a dark well room? Dont need the castings right now but because I just lost all my worms I am starting from scratch and cant afford to lose any castings. Oh, I have small frogs that keep getting into my worm container. Can I leave them in there or should I tell them to get? Keep up the good work. Very informative. I look forward to starting my bin. I am currently working on an organic farming program and we have a fairly large vermicomposting system set up. One of the issues we have is that it is very hard to get a consistent quantity of organic manure for our composting. We are able to get manure from non-organic livestock, but we are concerned about the fact that this manure will have antibiotic and other residues which we don’t want on our farm. I have heard that vermi can actually breakdown antibiotics in manure, but there is very limited data on this that I have been able to find. Do you have any experience with this or do you know if it is true that vermi can breakdown antibiotics and leave the vermicaste free of any nasty synthetic chemicals? Thank you for your wonderful website and discussion board. Well, I am pretty bummed this morning, went to check on the worms, only to find that @ 98% are dead. We purchased the Worm Factory back in the middle of May … added 1lb of Uncle Jim's 250 Super Reds European Night Crawlers. After I set up the factory per the directions and video provided, I realized just how many worms it was going to take to process our kitchen waste, and being the impatient and excitable person that I am ordered 500 more of Uncle Jims Worms, about 10 days later. Everything was going along splendidly (or so I thought), we live in Arizona and we are keeping the bin in the laundry room bathroom where the temp.is well within the range of 55-85 degrees… it could not have reached more than @81 degrees in the bin. It has been moist and conditions seem right. In August I noticed that a good sized group (100?) had migrated to the bottom of the bin… I removed the worm poop and put a layer of newspaper on the bottom of the first tray, moved the stray worms back in to the tray. By this time there was a lot of vermicast. I wanted to add the second tray and was letting them finish off the kitchen scraps and paper (eggshell carton) up so that they would be anxious to move up to a new tray. I checked them about a week ago and there were large clumps of worms gathered in the corners and all looked fine. There are gnats in the tray, but from reading other posts, do not think that they should be the problem. Did I not feed them enough? Any suggestions or ideas as to the demise of the worms would be greatly appreciated, as I would like to start again, but not until I have some clue as to why they did not make it; also is it possible that there are eggs in the vermicast that may still hatch? Are house plant trimmings safe for red wiggler composting? Are there any plants that are toxic to to the worms? I need to trim a euphorbia. I know the sap is toxic to people but I haven’t found any information about the effects on worms. I don’t want to throw away good composting material but I don’t want to poison my worms, either. As frequently said above, Great site! Jane, I am so careful in what I put with my worms. If I’m in doubt, I leave it out. Of course, I also have the old outdoor compost piles, so I would put any house plant trimmings in one of the old piles , and thus, not damage my composting worms. I have the same problem as justin ( Comment #29 – https://www.redwormcomposting.com/quick-facts-about-worm-composting/#comment-7237 ). The white mites dine on ANY worm that comes on to the surface and they seem to really bunch up in certain areas and are spread out elsewhere. Can somebody tell me if your reply to Justin is the only action to take in this matter? These guys get evil when a worm comes up. Otherwise they just sit all over the top and multiply in droves each day. P.S. I have no traces of food on the top of the soil. It’s all buried. I am new at red wigglers, I am worried that I am not doing it right. A friend of mine gave me a hand full from her bin with some worms. Using a plasic container I punched holes on the sides and used sredded newspaper for the bedding this was the new home for my worms. I have had my worm far for about 3 weeks now, I only feed then cattle manure and coffee beans, and they have at least doubled in qty. I have the following two questions. 1. How do I distinguish between the manure and the worm compost. 2. Although I feel my wormery is very wet, I have not really been able to harvest any worm tea. Thank you very much for helping us . your website is very helpful and we have learned a lot. Nature is really interesting who would have thought worms play big roles in our life..
i was just curious if the european worm is the same as african worm because here in our country me and my bestfriend started a little SWARM OF WORM . 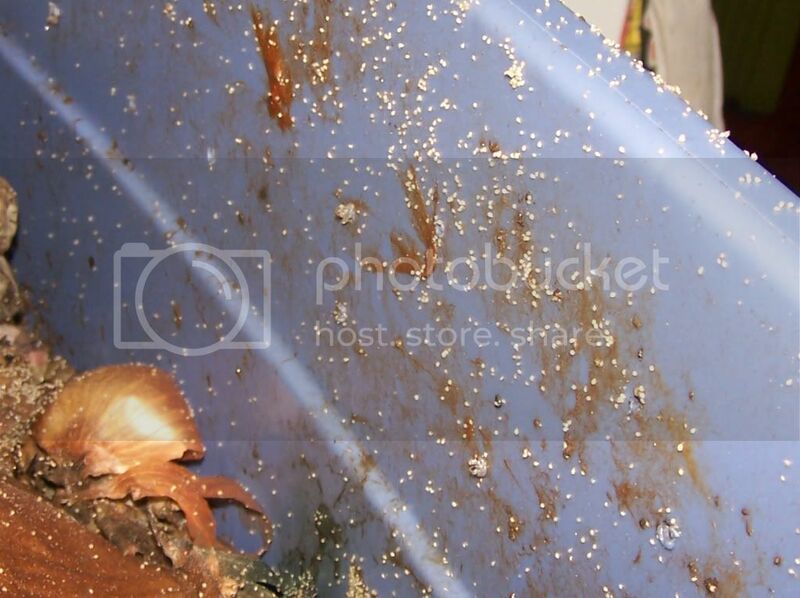 I was reading the comments on wood worm bins and using something to protect the wood. I found a wonderful product that is completely non-toxic and I will be using it when I construct my next worm bin. To date, I have found nothing better and it could be the answer to all your future wood finishing issues as well. This is another RWC page where I am unfortunately just not able to keep up with new comments. Very sorry everyone! Don’t hesitate to try emailing me, or to comment on newer blog posts – since your chances of getting a response are much higher! I did want to say thanks to Barb for the link though! Very cool. I will have to learn more about that product! Hello everybody this is Da’Monte a new person working on worm composting and ive been working on this for about a week now a it is a very cool subject to learn about b)! Thanks for giving me good informatiion for my science fair project and i will always come to this page for more information thanks and have a blessed life :). top. The worms dont seem to like crossing the wire. what happens when red worms are in freezing tempertures? Hi, My husband and I started our worm farm about two months ago, we bought approximately 500 red worms. We live in Australia and it is super hot here at the moment. We have a three tiered worm farm. To keep them cool and moist we have an insulating blanket on top of the compost which we wet down every few days. Everything’s been going great, but today my husband noticed that most of the worms have left the actual top compost tier and moved downstairs where there is only water (no food or compost) and some were dead in the water over flow – my husband believed they drowned not that something bad has happened. In the actual compost mix there are some worms but there is also lots of ants. Can you tell us what we might have done wrong? I am very impressed with your depth of knowledge giving sound advice for beginners and sharing valid information with experienced composters. I find many just pass information around so it ends up like that ‘whispers’ game children play. Some have no idea about the science or reasons behind why we do or don’t do things so their information is almost rumour and urban myth. I will definitely use your site as a point of reference as I work on keeping these worms happy and healthy. I had a nieve attempt some years ago with sad results. I’m loving this page, just read all the way through it. I got a worm bin (stacking kind) about a year ago…I’d say about four months ago I started putting stuff in it and recently the leftovers from juicing vegetables, so creating a lot of waste! I filled about three trays without even having worms yet…I then finally got worms, I think a qt is how they measured it, and then I put some cardboard in with the food waste and put the worms into the bottom one…with two above kind of waiting for the worms to get hungry. I got the worms a few weeks ago and have definitely seen babies and have lots of wiggling worms, I’m in Seattle and it’s cool here for the most part but not freezing. If I just “wait” for some time will the worms be able to go through all this stuff? I’m kind of wondering if I should get another worm bin just so there is more space…it’s not tightly packed so I think we’re good with air since I keep seeing worms when I check. I’m not really concerned but if you want to say anything I’d be psyched to see a response!! I’m loving having it and will be happy if someday I have worm castings. My Mother in Law has a worm bin too so I’ll help her start it out “right” with lots more shredded paper and cardboard along with the leaves/mulchy stuff and then adding kitchen waste gradually…I’ve slowed up on feeding them and have been giving most waste to the chickens instead. Props for how awesome you have been at replying to people’s questions!! I just started my worm farm. I have noticed under the burlap that I have some kind of fluffy white stuff growing. Should I be concerned? Don’t worry about them too much, though. They are tougher than you think. You just follow the simple rules and you will be fine. You should be able to see compost already, you just have to know what to look for. My guys are always exploring around the sides and lid of their bin. The entire surface has little brown specks…those are all castings. These guys live just to eat and poop; they are so incredibly efficient. I found in a cooler climate though, they seem to slow down a bit in the winter, at least mine did. You will know if you give them too much food…it could get stinky and moldy. They will still eat it all, but it takes longer and it is smellier. The newspaper bedding does cover up the smell though. I have lots of waste, and I chop it up quite fine and store it in a bucket in my freezer. I found that the smaller the scraps are, the quicker they will “disappear” and you will have compost sooner, too. Make sure if you freeze it that you thaw it first before dumping it in your bin. Freezing fruit scraps is an especially good idea, as it apparently kills those irritating fruit fly larvae. I have never had fruit flies in my bin, so I guess it works. Also, dont worry about the space. You would be surprised at how many worms can live in a bin. When they multiply (mine doubled in 9 weeks!) you can split them up or just leave them. Mine were happy to stay together. They are “self-regulating” so if the population gets too large, they will adapt like a lot of organisms do. You can either maintain the population or let them multiply by splitting them up and using another bin. Just remember that the more you have the more food they will need. Once you get to know your pets and their needs, it will be second nature to you. Wish you success and have fun! Look forward to visiting your site again. seem to like the scraps fairly rotted, and avoid the scraps that come straight from the table. need to be fed a certain amount of roughage like cardboard, paper and leaves for health? property with very bad soil. Thank you for you help! just wanted to share that i just harvested my first bin (of 5 in my worm factory) and placed in in my planters. so many eggs and baby worms i was so happy! i started in september so the bin took about 7 months to produce completed compost. I have a worm condo w/red worms in it. Its located indoors in the laundry room. The first bin did great, but when I started the second one the worms became suicidal. They get out of the bin and jump off the counter top.Several are dried up behind the washer. It only happens at night, so i now keep the lights on all night long, which seems to keep them in. Is there something I am doing wrong that upsets them so much? Thanks for your input. Love your site and I just joined the forum. Looking forward to learning all about vermicomposting. I just started my bin and it’s been about 2 weeks now. I keep it inside and I’m getting all the regular community of bugs (fruit flys, gnats, mites, etc). My bin is in the basement and my concern is can these other bugs get out of the bin and get in other parts of my house? Will the mites bury themselves in my carpet and live in there? Will the gnats find a comfy home in the basement and reproduce like crazy? The fruit flys are already flying around in my basement, but I’m using a apple cider vinegar trap for them. Also, how long does it take for the worms to get used to their new home? I put some scraps in there a couple of weeks ago and they still haven’t broken down that much. I think they might still be in love will all the bedding and eating that (cardboard & paper). I am interested in starting worm composting outside to handle the vegetable waste at our vacation house in the mountains. I am concerned about the possibility that animals (such as bears) might be attracted to the bin b/c of the smell of the food. Any info on this type of situation? I was thinking of buying one of those work composters that come with layers of bins. BTW, I have no seen or heard of any bears frequenting out lake community, and I don’t want to attract any either. We’ve been giving people worm farms (stackable types) as Christmas presents in Western Australia and South Australia, and were disappointed that in both cases they died due to the heat, even in shade. In each case the worms went to the bottom tray, and appeared to have drowned. The stackable types can only handle a number of hot days in a row, even if they’re fully mature and in the shade. We’ve now moved to Western Australia and don’t want to make the same mistake. The two options seem to be either to dig a worm tower into the ground, or make them out of broccoli boxes which are good insulated material, and free too. The stackable worm farms don’t appear well suited for places which get regular days in a row of 40C/110F, and with climate change, this is only going to be more so, so time to come up with a solution we reckon. I just came across your site this evening via a link from another site and would like to make a helpful contribution to the knowledge pool here and maybe solve the bug problems of a lot of the readers. However, I was introduced to a substance called diatomaceous earth, or DE, that does a good job at eradicating various creepy-crawlies. It is a powdered form of fossilized diatoms (microscopic algae/plankton) that is mostly silica and about 14 other trace minerals, so it’s all organic and non-toxic, no chemicals or artificial ingredients. Silica is the basic ingredient of glass, so it is sharp – especially when the pure DE is dug out of the earth in chunks, then pulverized to a fine powder. It is used as a mechanical insecticide, dusted on houseplants, garden plants, ant-hills, in homes, barns, manure piles, and wherever “anything with an exoskeleton” roams. The bugs, flies, maggots, caterpillars, cockroaches, ants, slugs, aphids, mites, etc. walk/crawl through the powder and it cuts their outer surface, or they ‘lick’ it off (watch an ant groom itself to see what I mean), ingesting some of it. Inside their bodies (outside, for slugs and snails), it’s as if they’ve eaten razor blades – they are minutely gashed, and then the ‘hydrophilic’ (water-loving) quality of the DE draws the moisture out of their body, literally dehydrating them. The neat thing? DE is totally inert, so once it’s in the soil, it doesn’t go away, doesn’t dissolve, although it will wash deeper into the soil because the particles are so fine – but it STAYS there, working its magic for many months. It kills grubs in the lawn, and basically every kind of insect – but not earthworms, which have a different structure and it’s not supposed to hurt them! I’ve put it on ant-hills in the lawn, and two days later the ants are totally GONE. (Watch that you don’t put it on the flowers when you dust it on blooming plants so you don’t kill the honeybees!) I’ve read that worm-farmers use it in their worm beds to eliminate insect pests and other types of worms, but it DOES NOT HARM THE EARTHWORMS! I use the food-grade DE from Perma-Guard (www.perma-guard.com/), giving it to my miniature dachshunds every day to prevent them from having intestinal parasites, and it can be dusted on them to eliminate fleas and ticks. (It doesn’t work too well that way, as they just shake it all off and it makes a dusty coating on everything in the house!) My dogs have had no problems with any kind of intestinal worms since I’ve been feeding them DE, and I use it myself – I add 1-2 tablespoons of it to my morning tea, adding valuable trace minerals to my diet. Our veterinarian recommended using it – she added it to her chickens’ dusting box and it killed off all their mites and lice, so their feathers grew back and they laid lots more eggs. She put up a bag of it so her cattle and horses could dust themselves, and they didn’t have ticks. For about four or five years a friend of mine has fed it to all the dogs in her breeding kennel to prevent them from having worms – it really works! When I bought my DE, I got a 50-pound sack from the national Perma-Guard supplier (he had his office and warehouse in Silver Cliff, Colorado, near where I lived then), which only cost me about $25 at the time. It’s a bit more expensive now, but buying in bulk from a feed store rather than a little dab from a health-food store is a lot more reasonable! Just make sure you are getting FOOD-grade, NOT the stuff to go in swimming-pool filters, which is NOT the same thing. It’s DE, but has been heat-treated and assumes a different form. I keep the 50-lb sack in a plastic trash can outdoors in the shed, but fill a plastic shaker-jar with it for use in the house, and for dusting on plants, the dogs’ food, etc. That’s what I would suggest for you vermi-people who have mites and weird little worms – my jar originally contained dry non-dairy creamer, but you can use whatever you have, as long as you can squirt or shake out a fine layer of the powder on top of your worm bed – up where those nasty little bugs are running and crawling around. Being hydrophilic, it is absorbent, too, and if you get too much in a wet spot it will form a hard cake, but you can break it up when it dries out again. I find it deodorizes as well, so your wet, stinky beds or decomposing kitchen scraps can be treated and should be a lot nicer to live with. Do a Google search for ‘diatomaceous earth’ – there are many fine sites with tons of information and testimonials about it! Use it with your worms – they’ll be glad you did! I appreciate you posting this extensive review of diatomaceous earth. It’s something I’ve been meaning to test out myself. That said, I personally don’t recommend using it freely in a vermicomposting system since this implies that essentially ALL critters other than worms are not welcome. This is definitely not the case, and I would not want to be needlessly killing off other beneficial organisms (primarily different kinds of arthropods) just for the sake of getting rid of the ones we actually don’t want. Good point, Bentley! I’m just offering DE as a non-toxic substitute for the poisons usually applied to eradicate mites and the like. If the mites and/or other critters ARE beneficial, leave’em alone, but we have a bunch of folks upset about the nasties crawling all over their beloved vermipets, and don’t want to sicken the worms while thinning out the pesty population. As I said above, I have not yet tried to do any vermiculture, especially indoors, but have certainly raised a LOT of houseplants – our 28×60 doublewide, an attached 8×24 sunporch, and a 300 sq ft freestanding greenhouse were all FILLED with plants – and bugs! In those days, I didn’t know about DE, but I would have tried dusting the soil in each pot and container with it, as well as the plants. I supply worms for people starting a worm bin through a non profit . Recently, people have wanted to put the red worms in a composting pile. When you harvest, the worms will die in the dirt. I could get too hot for the worms. You are depleting the supply of worms when you harvest. It does not speed up the composting process. DachsieMama – I think there are definitely situations where this is warranted. For example, when someone is raising composting worms for sale. Better to reduce the number of other critters the customer ends up receiving. PAUL – When you harvest compost you typically wouldn’t remove ALL the material from the bin. Your run of the mill backyard composter (eg “Earth Machine”) often has a bottom door for compost removal, while waste materials are continually added from above. So it’s unlikely you would just be leaving the worms in the dirt. If it’s a typical, larger batch hot composting system then, yes, it won’t be well suited for composting worms (a bigger heap might be ok as long as it had cool zones around the periphery). You wouldn’t necessarily be depleting the worms when harvesting if you separate them and put them back – aside from that, they reproduce very quickly so the population would replenish itself before long. Adding composting worms to a well-maintained backyard composter can absolutely speed up the process – it’s a fantastic way to do so, in fact. BUT you can’t be setting up and maintaining the bin the way many people do – basically just dumping in waste materials, sod, branches etc haphazardly. You DO need to treat it like a vermicomposting system. For all other kinds of livestock and pets, “more is better” when it comes to dealing with pest infestations, but for our earthworm farms and composting worms, go lightly! My dogs, and the dogs at the kennel they came from, have been using DE on a daily basis, added to their food – and I put it in my tea every morning, in case the dogs somehow transfer a pest egg or larva to me (such as by “doggy kisses”). We have not found ANY parasitic worms in the dogs’ feces. Bought in 50-lb. sacks, it is a very economical product, and you can then experiment with it – dust it on plants, on smelly spots on the ground or carpet (it even reduces old pet-urine odor! ), to dry up wet areas (it’s hydrophilic – “loves water” – and soaks up liquids; I used it to pull urine out of a mattress when a dog got too carried-away one day), sprinkle around the house to eliminate ants, roaches, scorpions, etc., etc., etc. I love DE, and I hope you find it beneficial in your worm-beds. Perhaps set up a small ‘test bin’ with a known population of pests to see how much it takes to eliminate the pests (mites, etc. that bother the worms), but not harm the earthworms. I save old shaker-jars, such as parmesan cheese comes in, to apply a thin, even dusting. 1. I’m using a homemade tiered system. So far, I have only one tier, placed on top of/inside of the lower bin which collects the leachate that drains from the tier with worms, bedding and food. A lot of worms have fallen through the bottom of the first tier into the leachate catching bin. Is this supposed to happen? I even put a screen in the bottom of the tier to avoid losing worms by falling through the bottom? Is this a problem, or is it just part of worm composting? The tier smells fine, but the leachate catching bin is kind of stinky, likely due to the worms that have fallen into and drowned (and likely rotting) in the leachate. I researched a lot of different DIY tiered systems, and none of them seem to troubleshoot worms falling into the leachate, even though they all instruct you to cut a bunch of holes in the bottom of the tiers. 2. Is the leachate normally harmful to any specific plants? Is it harmful because it has a bunch of rotting worms in it? 3. I have a ton of worm castings throughout the tier, but it is all spread throughout and not settling at the bottom. Do I need to just continue to wait for all of the material to breakdown/get eaten before I attempt to harvest the castings? How long does it normally take for a new system to fully breakdown all materials (bedding and food) into worm castings/compost? At this rate, I would be surprised to see the tier fully broken down before maybe 6 months to a year. Is this normal? Everything seems healthy – no smells in the tier, lots of healthy looking worms, lots of tiny baby worms, no mites or other unwanted insects. 4. Every once in a while, I will find a slug in the bin. Is that bad/good? I have removed a few of them. Should I continue removing them, or leave them in there? Also, I have noticed a few tiny snails. I have also been removing these; should I remove them or leave them? I know there is a lot here, but if you can answer any of my questions, I’d appreciate it! Thanks! Recently learned from our son in Calif. We are in SC Pa. We have a compost bin that can be turned, with airholes on the sides. I typically just add brown leaves, green grass or clippings and fruit and veggie discards. Is it as simple as buying the red worms and adding them to that mix? Very nice introduction and reference material, especially to newcomers. I started a bin a couple of months ago and notice it is a real trial and error process until you find the right balance. A couple of times I left the bin totally closed for more than 4 days and it became too humid. I found red tiny spiders once, white tiny creatures another. I simply sprayed a little bit of Citrofresh (www.citrofresh.com) on the surface. I was told that once the worms mature at around three months I should not let their eggs go along with the nice black soil, because they are not native to where I live now in Ottawa, Canada. Should they always stay in a closed bin or indoor planter?. Thank you for your comments. I would like to include an editorial on this topic in an upcoming edition of Organic & Wellness News. Unfortunately, I just can’t keep up with a lot of the questions posted here (and on older posts in general). Don’t hesitate to e-mail me with questions. Still some delays, but much more likely you’ll get an answer. Farzad – Red Worms are widespread in Canada, but remain in close proximity to human habitation. They pose no threat to natural ecosystems, thriving primarily in very rich deposits of organic matter such as farmyard manure. As such, they can certainly be used in outdoor systems (other considerations though if you live in a location with extreme seasonal fluctuations in temps etc). Most of the same questions as eric 189. New comer also. Awaiting reply. Have you emailed me your questions, Steve? So do worms like watermelon and the rinds? Can you please tell me if it is ok to use Elephant manure in the worm bin. Are these worms okay to used for my compost? Can a worm bin be used outside? What temps can worms haandle? NOTE: I will be closing the comments section on this page. Please send in your questions by filling out the form on the Contact page. ERIC – Composting worms LOVE watermelon rinds! DAVID – Elephant manure should work really well, but I’d give the same advice I would give for most other manures and tell you to use only aged material (ideally stuff that’s sat outside for a period of time). RACHEL – if they ARE indeed the same “Red Wigglers” used for composting you should be ok (but you won’t get many so it will be very easy to overfeed). CHAD – Composting worms should not be allowed to experience temps up above 90 F if at all possible. I recommend not using outdoor systems in locations where these temps (and higher) are common. I also just generally don’t recommend using plastic bins outside – unless it can be kept in a sheltered location (if sun shines on a plastic bin it can turn into a little oven).